Challenge 2000, the Wellington faith-based agency that supports young people achieve and develop their potential, has a range of activities for 2018. During Lent, every Friday there are reflection evenings for young adults at the Marist Challenge 2000 House, 1 Wanaka St, Johnsonville, and there is a ‘Journey to Jerusalem’ weekend camp up the Whanganui River, 9–11 March. Our 2018 Marist Challenge Gap Year for school leavers wanting to discern future steps and choices, began on Monday 19 February. It offers formation, work placements, development opportunities and life-changing experiences in New Zealand and overseas. And our new fulltime service-internship programme for 18‒21- year-olds still has a vacancy. At the end of last year, Challenge 2000’s youth ministry team celebrated several milestones with students, family and friends. Eight young participants enrolled in our Marist Challenge Gap 2017 programme graduated at St Joseph’s Mt Victoria in front of 150 family and friends. Also in December, 18 senior college students from Bishop Viard, St Pat’s Town, St Mary’s College and Newlands College, joined a leadership-formation pilgrimage to reflect on how to use their gifts to serve others. 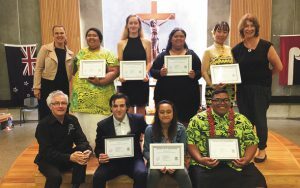 They journeyed to the Catholic Youth Festival in Auckland. While there they visited the Auckland City Mission, which they described as ‘transformational’. and were deeply affected by Auckland’s homelessness and poverty. Our annual social justice pilgrimage visited Bishop Max Mariu’s resting place near Turangi and the young adults recommitted to working alongside tangata whenua, bringing the gospel to life. Last year, the formation experiences, holiday programmes and end-of-year Christmas hamper deliveries all helped our young leaders to serve and make a difference. Find out how you can get involved Challenge 2000 programmes by visiting our website at challenge2000.org.nz or contact Courtney on 027 728-0174 or Dan on 021 459-997. Courtney Halliday is a Youth Worker with Challenge 2000.